m i n e r e s c u e c o n t i n u e d 600 individuals, as well as the crowds of guests and busy exhibit hall participants that mine rescue competitions of all sizes are crucial to keep skills polished. "Until a day when serious mining acci- dents are problems of the past, we will be meeting like this — honoring your selfless dedication that has been on impressive display this week," he said as he recog- nized the competition winners at a cere- mony that officially concluded the event. NMA was also on hand to detail the lat- est with its CORESafety program, which it calls a systems approach to mine safety. Launched to the mining industry in 2011, it now claims more than two-thirds of its association membership as active partici- pants. Assistant Secretary of Labor for Mine Safety and Health Joseph Main added that, while everyone hopes real-life disasters that the competition tests represent will never happen, preparation at such events will keep members sharp. "Having been on the ground during a number of mine disasters and emergen- cies, I understand the importance of the skills competition that took place this week in Lexington," he said. "I know first- hand what it means to call upon our mine rescuers at a moment's notice after a fire, explosion or roof collapse, to travel miles underground to find and rescue missing miners. "Our hats go off to those volunteers who worked hard to make the 2015 national contest a real success — from the competitors to the trainers, companies, vendors — and, most importantly, to the families who have supported the teams. We are a better industry as a result." 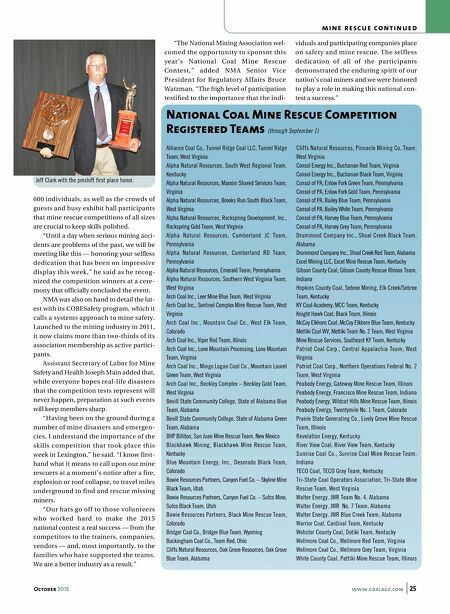 "The National Mining Association wel- comed the opportunity to sponsor this year's National Coal Mine Rescue Contest," added NMA Senior Vice President for Regulatory Affairs Bruce Watzman. "The high level of participation testified to the importance that the indi- viduals and participating companies place on safety and mine rescue. The selfless dedication of all of the participants demonstrated the enduring spirit of our nation's coal miners and we were honored to play a role in making this national con- test a success." 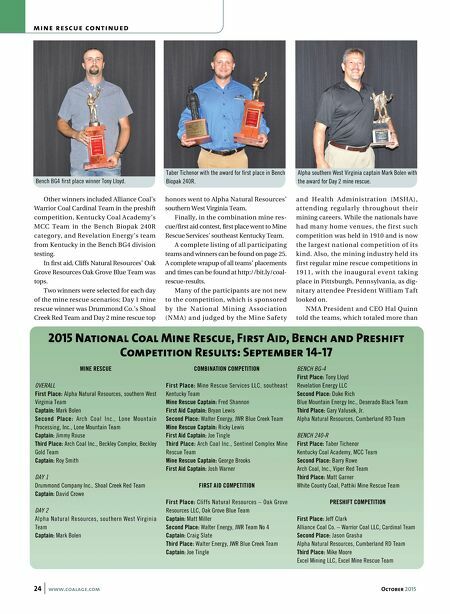 October 2015 www.coalage.com 25 Alliance Coal Co., Tunnel Ridge Coal LLC, Tunnel Ridge Team, West Virginia Alpha Natural Resources, South West Regional Team, Kentucky Alpha Natural Resources, Maxxim Shared Services Team, Virginia Alpha Natural Resources, Brooks Run South Black Team, West Virginia Alpha Natural Resources, Rockspring Development, Inc., Rockspring Gold Team, West Virginia Alpha Natural Resources, Cumberland JC Team, Pennsylvania Alpha Natural Resources, Cumberland RD Team, Pennsylvania Alpha Natural Resources, Emerald Team, Pennsylvania Alpha Natural Resources, Southern West Virginia Team, West Virginia Arch Coal Inc., Leer Mine Blue Team, West Virginia Arch Coal Inc., Sentinel Complex Mine Rescue Team, West Virginia Arch Coal Inc., Mountain Coal Co., West Elk Team, Colorado Arch Coal Inc., Viper Red Team, Illinois Arch Coal Inc., Lone Mountain Processing, Lone Mountain Team, Virginia Arch Coal Inc., Mingo Logan Coal Co., Mountain Laurel Green Team, West Virginia Arch Coal Inc., Beckley Complex – Beckley Gold Team, West Virginia Bevill State Community College, State of Alabama Blue Team, Alabama Bevill State Community College, State of Alabama Green Team, Alabama BHP Billiton, San Juan Mine Rescue Team, New Mexico Blackhawk Mining, Blackhawk Mine Rescue Team, Kentucky Blue Mountain Energy, Inc., Deserado Black Team, Colorado Bowie Resources Partners, Canyon Fuel Co. – Skyline Mine Black Team, Utah Bowie Resources Partners, Canyon Fuel Co. – Sufco Mine, Sufco Black Team, Utah Bowie Resources Partners, Black Mine Rescue Team, Colorado Bridger Coal Co., Bridger Blue Team, Wyoming Buckingham Coal Co., Team Red, Ohio Cliffs Natural Resources, Oak Grove Resources, Oak Grove Blue Team, Alabama Cliffs Natural Resources, Pinnacle Mining Co. Team, West Virginia Consol Energy Inc., Buchanan Red Team, Virginia Consol Energy Inc., Buchanan Black Team, Virginia Consol of PA, Enlow Fork Green Team, Pennsylvania Consol of PA, Enlow Fork Gold Team, Pennsylvania Consol of PA, Bailey Blue Team, Pennsylvania Consol of PA, Bailey White Team, Pennsylvania Consol of PA, Harvey Blue Team, Pennsylvania Consol of PA, Harvey Grey Team, Pennsylvania Drummond Company Inc., Shoal Creek Black Team, Alabama Drummond Company Inc., Shoal Creek Red Team, Alabama Excel Mining LLC, Excel Mine Rescue Team, Kentucky Gibson County Coal, Gibson County Rescue Rhinos Team, Indiana Hopkins County Coal, Sebree Mining, Elk Creek/Sebree Team, Kentucky KY Coal Academy, MCC Team, Kentucky Knight Hawk Coal, Black Team, Illinois McCoy Elkhorn Coal, McCoy Elkhorn Blue Team, Kentucky Mettiki Coal WV, Mettiki Team No. 2 Team, West Virginia Mine Rescue Services, Southeast KY Team, Kentucky Patriot Coal Corp., Central Appalachia Team, West Virginia Patriot Coal Corp., Northern Operations Federal No. 2 Team, West Virginia Peabody Energy, Gateway Mine Rescue Team, Illinois Peabody Energy, Francisco Mine Rescue Team, Indiana Peabody Energy, Wildcat Hills Mine Rescue Team, Illinois Peabody Energy, Twentymile No. 1 Team, Colorado Prairie State Generating Co., Lively Grove Mine Rescue Team, Illinois Revelation Energy, Kentucky River View Coal, River View Team, Kentucky Sunrise Coal Co., Sunrise Coal Mine Rescue Team, Indiana TECO Coal, TECO Gray Team, Kentucky Tri-State Coal Operators Association, Tri-State Mine Rescue Team, West Virginia Walter Energy, JWR Team No. 4, Alabama Walter Energy, JWR No. 7 Team, Alabama Walter Energy, JWR Blue Creek Team, Alabama Warrior Coal, Cardinal Team, Kentucky Webster County Coal, Dotiki Team, Kentucky Wellmore Coal Co., Wellmore Red Team, Virginia Wellmore Coal Co., Wellmore Grey Team, Virginia White County Coal, Pattiki Mine Rescue Team, Illinois National Coal Mine Rescue Competition Registered Teams (through September 1) Jeff Clark with the preshift first place honor.